Just inflate, color and play! 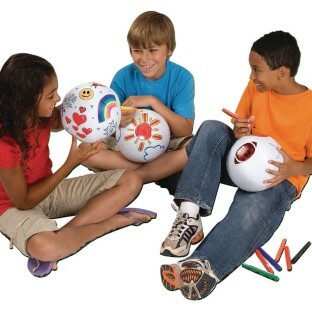 Just inflate, color and play! A super fun individual or group activity for any season! Recommended use with permanent markers (see our AS593 or SC898). White beach ball is .25mm thick (approx. 25% thicker than the average beach ball). 12". Pack of 12. I use this product in my Resort Activities. It is great for many ages to do. It is advised to use permanent markers on this product however it is not color safe for water use. Using PERMANENT markers kids can create a FUN art project that will not get dusty on a shelf!Get Creative! Each section of the beach ball can be the kids view of each days Bible lesson from Vacation Bible School.Work from the top down! Permanent markers take a few minutes to really dry.Have kids Lightly draw on their design with a pointed crayon or dull pencil not pressing too hard and then use the Permanent markers from the top down.Love the Color Your Own Beach Balls!!! soft so if kids get hit in the face it won't hurt them. very compact--fill with air when in use and let air out when not in use. can make personnal with artwork. mY CHILDREN WENT BANANNAS OVER THIS. iT HAS MULTIPLE USES: ARTISTIC CAN BE USED FOR GAMES.